Like the EDC-1 before it, the Emerson EDC-2 has sold out on the company’s website (www.emersonknives.com) and they may not get it back in stock. So, I will say this: Rugged individuals who puts a lot of demand on their knives and tools will benefit greatly from this pocket tool. Someone looking to just put a nice knife in their pocket to open mail from time to time should keep moving—nothing for them to see here. Overall, the EDC-2 is simple to use—after all, it’s built for function more than form. But there’s a learned curve associated with it. 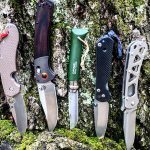 Emerson knives have a patented “wave feature” which is their version of assisted opening. If you are not used to this, you WILL open the knife in your pocket. Because of the curved shape of the blade, it cuts differently than most blades you would be used to. I was able to overcome both of these little bumps, in time. But, I definitely favor the other tools on the EDC-2 over the blade itself. A feature that could go over-looked is the ability to lock the screwdrivers at 45° and 90°. This comes in handy for a multitude of different tasks. The 45° lock came in handy when I was repairing an old camping stove and needed to get into a tight spot. 440C is a great stainless steel made even better when it is coated so that it cannot rust, etc. It will also keep a pretty decent edge for a long period of time. I shredded through a pile of cardboard for kindling and a bunch of old rope and though the blade looks a little beat up, it’s still just as sharp as it was when I took it out of the box a month ago. I took a lot of pleasure in beating the snot out of this knife, and it’s still laughing at me. It’s built for abuse, which is something you should expect from Emerson and Multitasker. I’ll proudly tell you that I jammed the awl through a piece of 1/16-inch aluminum . That action would have rounded the head of most awls but not this one—it’s still as sharp as the devil’s tooth. I’m really impressed. Sidenote: One day during the testing process I set this sucker up in my vice with the flathead locked in at 45° and whacked it with a hammer. Yeah man, just took a swing. Nothing. Not a mark. No issues. This isn’t the type of knife you’re going to find on a shelf in your typical camping store. You search out a knife like this. The materials and construction are so fine-tuned that you would think it was custom built for you. It’s these features, however, that might keep the average consumer away. But we’re far from average!